Mallards can be dirty ducks. Very, very, dirty ducks. 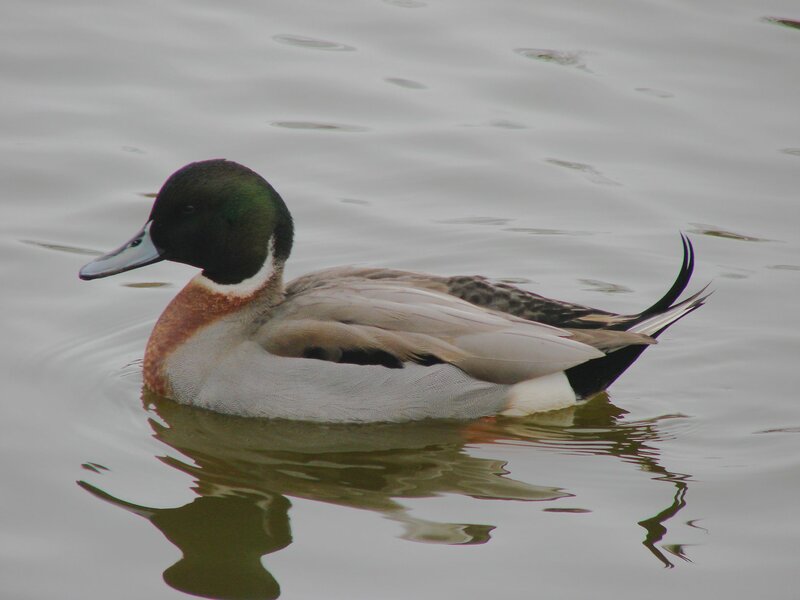 And while ducks in general are known for their hybridizing ways, none are as prolific and undiscriminating as Anas platyrhynchos. 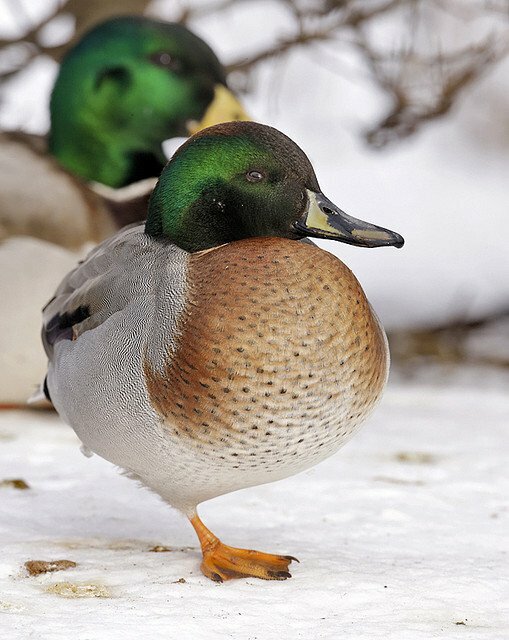 The list of species that Mallards are known to have hybridized with is long and in some cases Mallard genes threaten to flood the gene pool of other species. 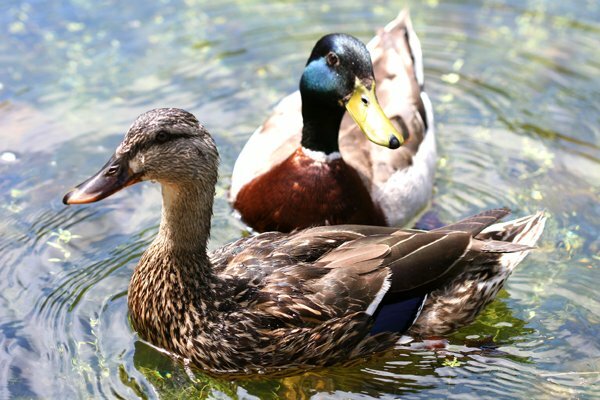 Note that in discussing hybrids here I am not including the wide variety of “Manky Mallards” which result from domestication and from wild Mallards mating with a variety of domestic breeds. What will be covered in this post is the offspring of Mallards and other species of wild ducks, some of which are startlingly beautiful. First, however, we should take a look at the ordinary Mallard, both male and female, so as to establish a baseline, if you will, for Mallard-ness. Below are ordinary and, so far as I can tell, pure, Mallards. 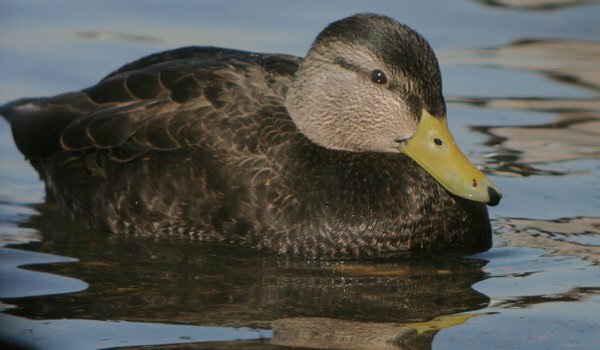 The most likely of other species for Mallards to hybridize with, at least in North America, is the American Black Duck Anas rubripes. Hybrid male Mallard X American Black Duck can be rather readily identified. They tend to look like the American Black Duck but with Mallard-green on the head. Often they have the Mallard‘s curled tail feathers and paler coloration then a pure American Black Duck on their back and flanks. When one takes into consideration backcrosses there is a bit of variety but it should be apparent when one is dealing with a male American Black Duck with even a bit of Mallard in it. 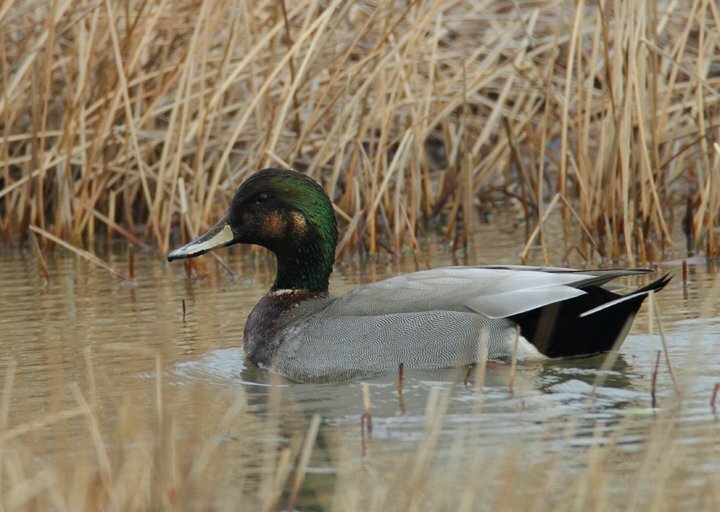 Hybrid females are more difficult but can be picked out by looking through female Mallards and finding a darker individual and then looking for other characteristics that don’t match either Mallards or American Black Ducks exactly, like the speculum having some white but not as much as a Mallard would. That’s how I found the female featured below. Another bird the Mallard hybridizes with relatively often is the Northern Pintail Anas acuta. The resulting duck is beautiful and whenever a photographer sees one he takes advantage for sure. 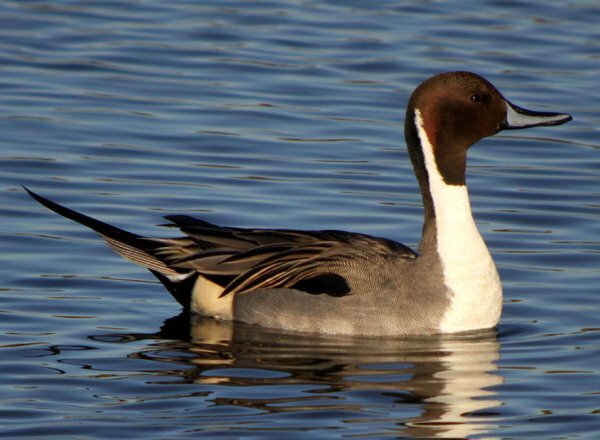 I have not yet laid eyes on a Mallard X Northern Pintail but I can’t wait until I do. 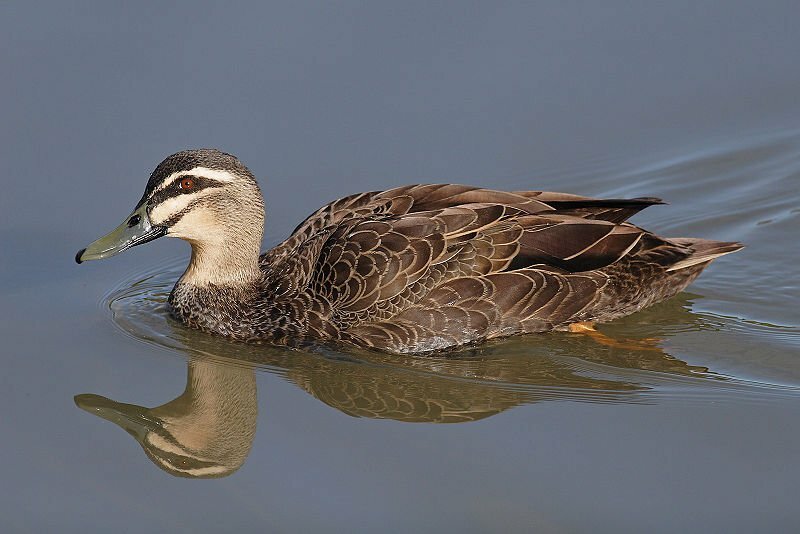 The Pacific Black Duck Anas superciliosa is a simply gorgeous duck, especially considering its limited palette, that also occasionally gets involved with Mallards and the result is, sadly, somewhat less stunning. 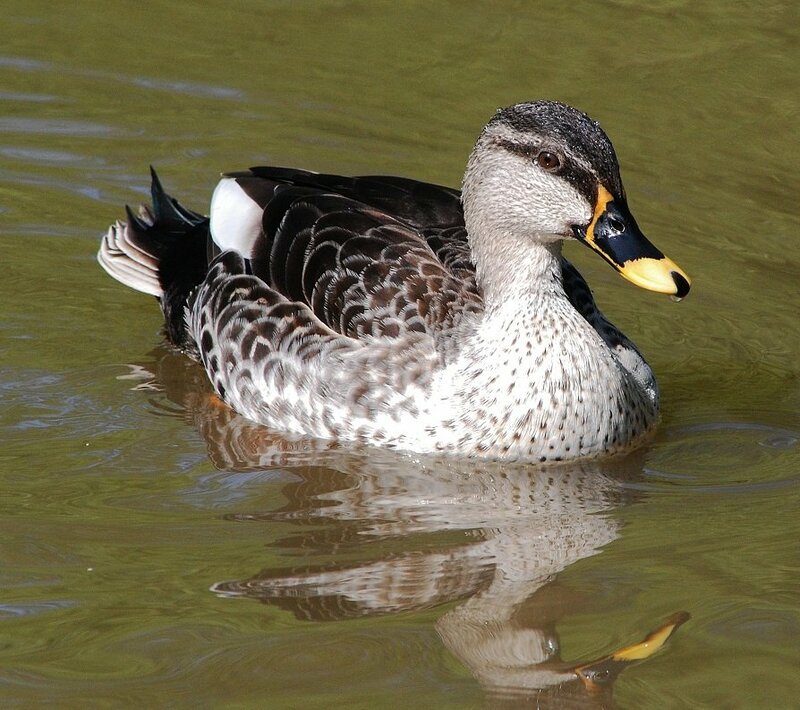 When Mallards mix with Gadwall Anas strepera the resulting offspring is known as Brewer’s Duck, named by John James Audubon after his friend, the ornithologist Thomas Brewer. Of course Audubon thought that the bird he shot in Louisiana was an entirely new species instead of the hybrid that it is. Mallards are fascinating creatures in and of themselves and become even more so when their genes mix with other ducks. I hope you enjoyed this small gallery and check back now and then as I plan to keep it growing because, of course, these few ducks are just a small sample of the hybrid Mallards out there in the world. If you have a good image of a Mallard hybrid that I can add to this post please feel free to leave a link in the comments or email it to 10000birdsblogger AT gmail DOT com. Thanks! 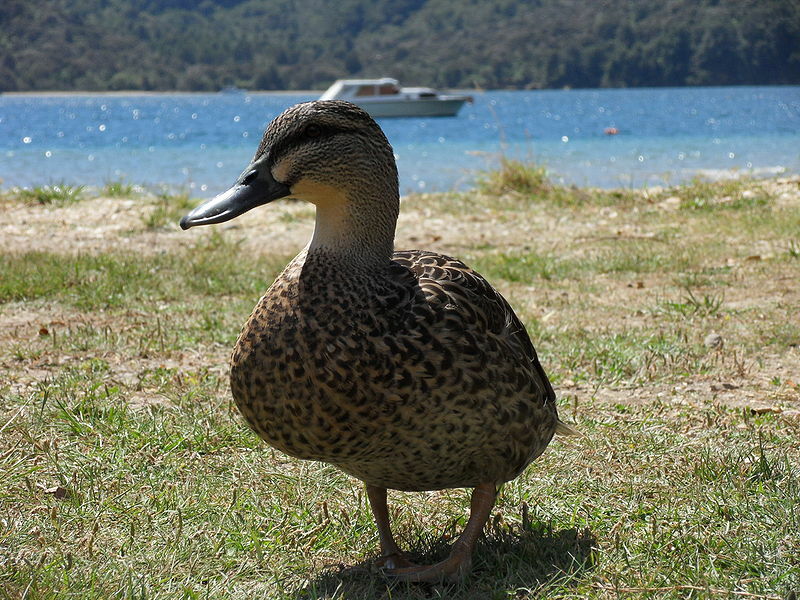 The Mallard is expected to cause the extinction of the Pacific Black Duck within New Zealand in the next ten years. There are only a very small number of small pockets of pure PBDs, and no plan or intention to save them as the species is still secure elsewhere. Whether this is a good call is a matter for debate, but it isn’t like New Zealand doesn’t have enough endangered endemics to deal with. That is sad news about the fate of the Pacific Black in NZ. About 30 years ago I saw a strange duck which stood aside from the rest of a mixed flock of ducks and geese and moorhens etc in a park near Adelaide, South Australia. It was as large as and coloured similarly to a very big domestic or wild mallard (introduced to Australia) but its general stance, beak-shape and crest on the back of the head was just like an Australian Wood Duck (Chenonetta jubata), a very common native waterfowl. I wondered at the time if it could have been a hybrid. I have now found out that Mallard boys go after many species of ducks all over the world and there are hybrids popping up everywhere. However I have not heard of this particular hybrid occurring in Australia anywhere since; only the common problem of the hybridising of mallards with Pacific Black Ducks. I wished at the time I had had a decent camera. Have you heard of this hybrid occurring? Maybe you don’t have Chenonetta jubata in NZ…? @Lloyd: Thanks, I may very well take you up on that. @Duncan: I guess time will tell? Here’s hoping that it ends up being a wise decision. For several years we have had a pair of mallards visit our yard. This year they have a male wood duck with them and while he followed them like a dutiful son, he is now becoming solely interested in the female, and is often seen chasing the male mallard away, aggressively. It will be interesting to see what the ducklings will be when they hatch. I was directed to this page from a birding forum when I was trying to identify a mallard hybrid I photographed in Central Park on 4/17/11. It resembles the hybrids pictured here in Nassau county, but still looks different. I was told that it could be a second generation hybrid. If you have any thoughts on it I’d appreciate them, I haven’t been able to find out a whole lot of info. If you think any of these would be useful to add to your site please feel free. I live in a residential area with no ponds nearby. We saw a duck walking up the middle of the block at 9:30 at night and went to get it out of the road so it wouldnt get hit. It didn’t run or try to fly. Could this be a pet? My husband put it in a large dog cage with a tote of water and some towels and some cover from the weather. 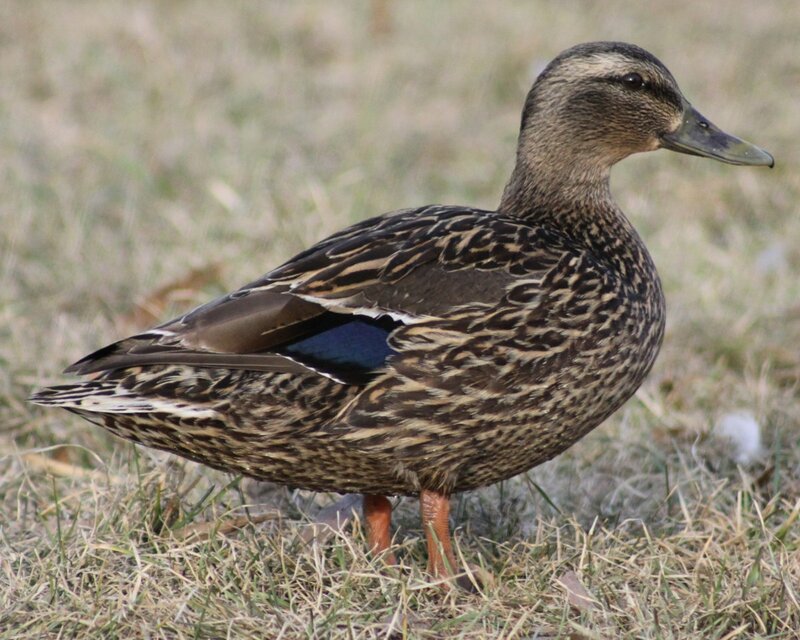 It looks like the picture of the female mallard x american black duck. Could it’s wings be clipped, or are they the type that don’t fly much? Didn’t want to set it free to fall to prey if it’s a pet. I just posted these today. There are several “mallards” much larger than the standard mallard. 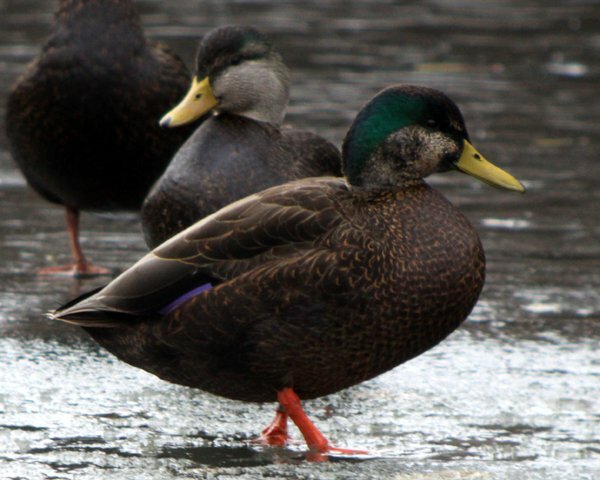 I saw a black duck+mallard hybrid on turtle pond recently. It was paler than the one in your picture, so I origionly thought it was a widgeon. I also saw a wierd one in November, it looked like the gadwall+mallard hybrid, but it had a competely white back, tail, and belly. What was it? 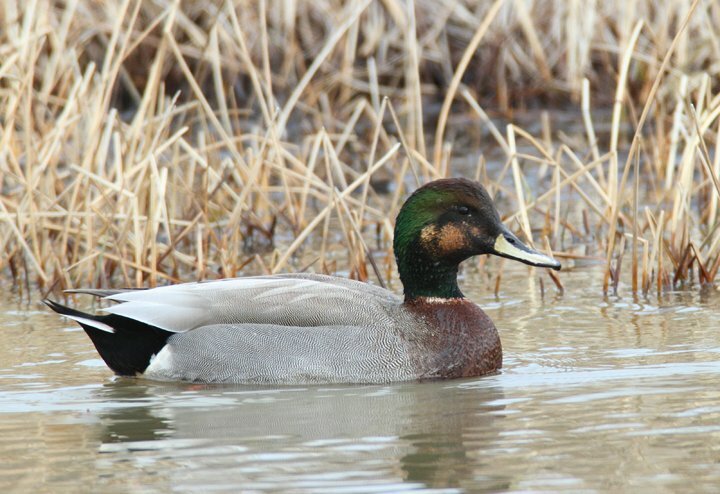 Last weekend I was duck hunting and shot a half widgeon and half green head mallard duck. I was hunting with some older avid duck hunters and they said that was extremely rare. Is that rare to see and shoot? A Mallard drake with some mix of Pintail perhaps x female Pintail-like duck. The female is quite similar with the one in Kissena Park. I am trying to identify a bird that has the exact same coloring as a female mallard but with a slim straight beak (not the traditional duck shape) and an elongated body. Although our resident mallard is chunky and doesn’t fly, this bird is extremely swift in the water; swimming and skimming and flying very well. Everyone else seems to think it’s a duck but I think it’s something else. I was at Mingus Park in Coos Bay, OR this afternoon and came across a couple of ducks that I’ve never seen there before and never seen anything like them elsewhere, either. Very dark iridescent plumage with what looks like a Mallard head. If it’s a hybrid…between a Mallard and what else??? Thanks to anyone who can help identify! I’ve been wondering what kind of ducks I got this year. They appear to be Muscovy x Mallard. Pretty brown and white with a touch of the red around the bill that Muscovies have and the brown feathers were shining iridescent green in the sun yesterday. As babies, I thought they were mallards but also looked like Muscovy. Very nice backyard birds though. I just got my Duck back from the taxidermist and still don’t know….a lot of my friends have opinions that it is either a Mallard X Widgeon or a Mallard X Gadwall. Looks to me like a Brewers duck bred with a pintail…Email me to see the pictures. This is a hyrbrid between a Mallard duck and a Northern Pintail. Where Are You Birding This Second Weekend of June 2012?